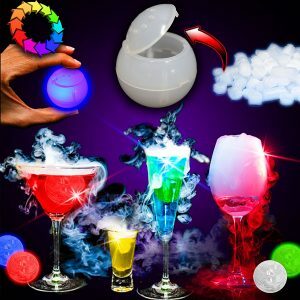 Dry Ice Bubbles are a convenient way to turn your ordinary drink into a disco fever madness party. These little balls have a small opening to insert 1-2 pieces of pellet dry ice into. Once the dry ice is inside the bubble, just press the on/off switch until you get your desired color and drop it into the drink. A pack of 3 unique dry ice “bubbles” (42mm diameter) with a snap close lid which can be prised open and a pellet or two of dry ice dropped inside. 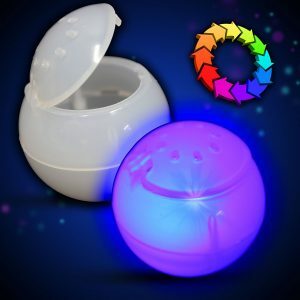 Then, with the lid snapped shut, the LED array can be activated (choice of 7 colours or rolling colour change). When popped into a drink a glorious coloured light and “smoke” effect gives the party a boost! Are you running a restaurant or F&B outlet and would like to use dry ice inside your drinks? Look no further, our dry ice bubbles will safely contain the dry ice to prevent your customers from accidentally swallowing or coming into contact with the dry ice while still allowing the foggy effect to appear. Give us a call or shoot us an email if you’d like to find out more!